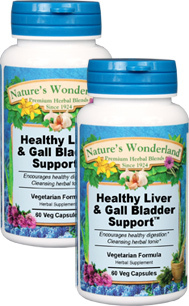 Healthy Liver & Gall Bladder Support™ - 450 mg, 60 Vcaps™ each (Nature's Wonderland) - Penn Herb Co. Ltd. The liver is part of the body's filtration system and works with the gallbladder to help the body properly digest fats. However, alcohol, processed foods, and pollution can put a heavy burden on these organs. Cleanse, nourish and protect your liver & gallbladder with our tonic formula. MILK THISTLE…helps protect the liver from the effects of toxins, alcohol and environmental pollutants. DANDELION, RED CLOVER…traditional liver cleansers help flush toxins. YARROW, RHUBARB, BUCKTHORN BARK…supports bile flow for healthy digestion and elimination. Supports liver & gallbladder function.